Blurb:JaceSome would say I have it all. I never thought I needed anything else until I met her. I looked into her hazel eyes and noticed the fear and pain lingering beneath them. It should scare me off, but it just pulls me in. She never lets me get close, but there’s something about her past that rubs me the wrong way. I feel the urge to find out the truth at all costs. She says all she wants is a friend, my heart though, dammit my heart…wants to be all in. We moved here to escape the past. We moved to escape the pain and the memories. I knew it was going to be different, but I never expected to find my soul mate. Jace is all wrong for me. He’s too perfect. The complete opposite of everything I am. He’s the best wide receiver, smart, funny and so good looking it hurts. I know I should stay as far away from him as I can, but for some reason every time his blue eyes meet mine, my heart flutters out of my chest. Trusting him is one thing, but falling in love is not an option. Especially when my father’s killer is looking to silence me once and for all. 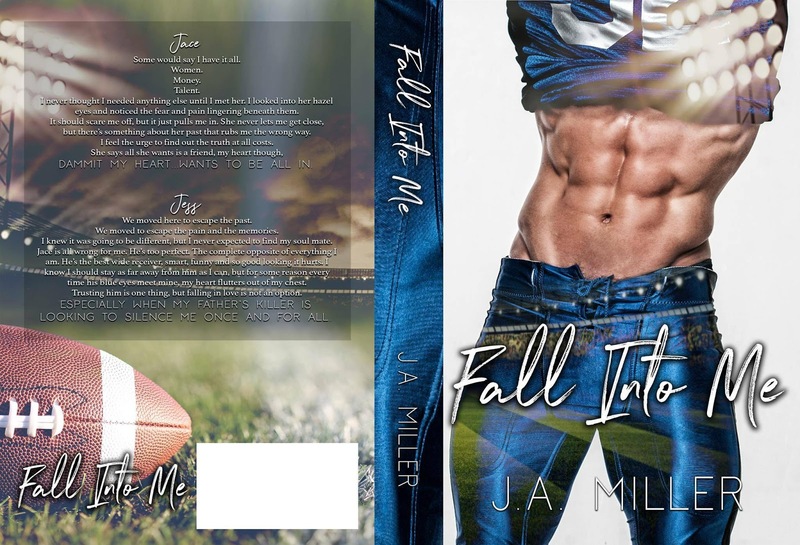 Posted on 21/10/2017, in Authors & Books, Blurb, Coming Soon, Cover Reveal, Want to read and tagged #coverreveal, #FallIntoMe, #JAMiller, @Shock_N_Awe_BB. Bookmark the permalink. Leave a comment.